Ya’ll ready for art fair week? 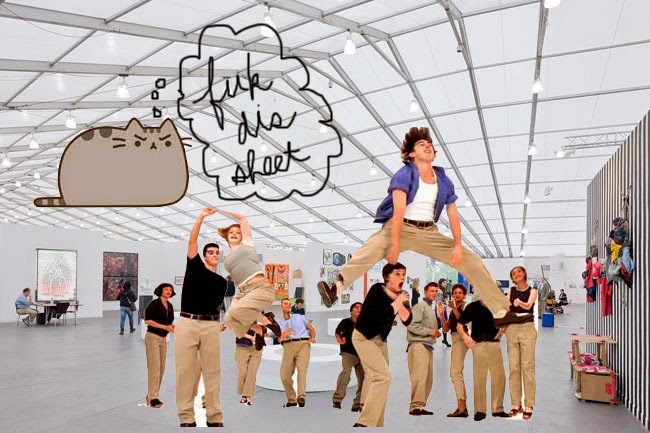 What is basically Frieze NY Week? You all siked for all the hoopla? I’m not in some ways, and I am in others but one thing is for sure, I will only make it by the skin of my teeth. To brace myself for this absurdity I am basically doing two things to maintain my sanity. 1) Not drinking a drop of the alcohol 2) Not going out unless I absolutely have to. That means work, zone out and then work some more. This isn’t and shouldn’t be for those coming in from lands far and near for this week though. They, you, everyone else, will be canoodling and schmoozing till you actually believe everything you are saying. This is fun to do, it is necessary for good business and when you are only in beloved NYC for a week or less you have to cram it all in like the world might end at 6pm Sunday. Already there has been out of towners that have asked me for recommendations for this that and the other thing. There is too much to even begin to recommend but below are some top picks for eating, chilling, art viewing and general culture temperature gazing for this that or other. Have fun and remember, relax, its just art baby. Go to Chelsea - Pick a few shows, trying to do a lot here will make you tired and resentful of the whole thing. See Sigmar Polke at MoMA - I have had no time to myself but I am drooling too. Pass on - the Whitney Biennial - Bor-ing. (Besides Stuart Comer's floor), really not worth it just to say you saw it. Go see Urs Fisher at Gagosian - I’ve said it once and I’ll say it over and over again. Fisher is a poor man's/frat boy's Martin Kippenberger but damn he just doesn’t give a crap if he is and THAT is something to see. Go to LES - It’s easy breezy while at times repetitive. But it is worth it and there are lots of good places to eat and shop in between. Go to openings - As many as possible and be prepared to not see anything on view. I eat at like ~15 places in the city over and over again, I like what I like and most places are overrated but below are some nice picks for intimate dinner meetings or a grander affair. Café Pastico - Near the East Broadway F, it is passably good Middle Eastern food but it is nice and cozy and slow which makes it very easy to spend hours in. Peasant - Italian in Soho because somehow you always end up in Soho. Sel De Mer - If you are in Williamsburg near the Graham Ave L, this is a good quaint fish place to have actually some very yummy food. Barrio Chino - Always packed Mexican place in LES, good place to bring people that want to experience that trendy LES packed feeling. Pho Pasteur - On Baxter street. I always get the Pho places mixed up. I think this is it, it has larger windows in front. Super cheap, super yummy, super for when you want food -now-steamy-hot. Forlini’s - On Baxter as well, a forgotten Italian dive-esq bar. Never very full. Sometimes they have good mozzarella sticks, sometimes they don’t. Beverly’s - I keep going here but I’m not sure why. Café Dancer - I stopped going here but art people still like it. Swat Bar - Overpriced drinks but hell, they have karaoke. Daddy’s - My true, blue bar in Williamsburg. Go to - Central Park. I know it’s a park but it’s actually nice to walk through for a bit. Go to - Any restaurant that is crowded. Lots of turnover means good food most times. Go to - Essex Street Market. I wish I lived above this place. Eat - Oysters, this city has been loving oysters for a few seasons now. You can get them cheap and they are usually very fresh. Get drunk at your hotel - Hotel bars are super fun. Live the life and enjoy your panoramic city view. Don’t go to hotel after parties - You probably will end up at more then you can count but I have three words for you. Hotel. After. Party. Go to a friends, clients, collectors, artist’s homes - For food, for drinks, for a general hello, go to as many of these as possible. This is what the city and life are about. The people and the time you get to spend with them in intimate, open ways.